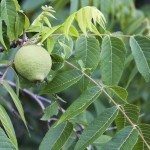 Will a persimmon tree grow near an established Black walnut tree? I live in Pennsylvania near Philly. The roots of the black walnut leak this toxic chemical into the soil, where plants sensitive to juglone may absorb the toxin. 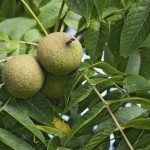 The best defense against black walnut toxicity is to avoid planting gardens and orchards near black walnut trees. If space is an issue, creating raised garden beds may protect plants from juglone toxins.